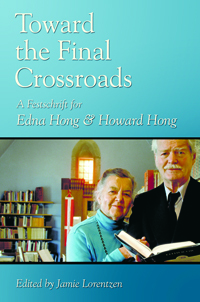 Edna Hong and Howard Hong have touched and influenced thousands upon thousands of students, colleagues, scholars, readers, and friends. To honor this contribution to the world, this text offers critical essays and personal memoirs from Kierkegaard and philosophy scholars, pastors, colleagues, friends, family members, and former students closely acquainted with the translations, teaching/writing/library activities, and personal lives of the Hongs. Among the many accomplishments of the Hongs: • Founders of the Hong Kierkegaard Library at St. Olaf College; • General editors and translators of the seven-volume Søren Kierkegaard’s Journals and Papers series (Indiana UP) and the twenty-six-volume Kierkegaard’s Writings series (Princeton UP); • Winners of the National Book Award for Translation; • Refugee workers in post-WW II Germany, serving field positions in Scandinavia, Austria, and Germany from 1943 to 1949, and aiding war prisoners and refugees; • St. Olaf College and Sunday school teachers/scholars in Northfield, Minnesota, between 1938 and 1983 • Writers: Edna: Clues to the Kingdom (1968), The Book of a Centuy (1969), Turn Over Any Stone (1970), The Gayety of Grace (1972), Grateful Ground (1974), Bright Valley of Love (1976), The Downward Ascent (1979), The Way of the Sacred Tree (1983), Forgiveness Is a Work as Well as a Grace (1984), Box 66, Sumac Lane (1989) and poetry and stories in various magazines; Howard: The World and the Church (1955), editor of Integration in the Christian Liberal Arts College (1956), and Christian Faith and the Liberal Arts (1960); Cowriters: Muskego Boy (1943, 1971) and The Boy Who Fought with Kings (1946).